The post entitled “CIWA Demystified” is one of the most popular on this blog. This type of symptom triggered therapy for alcohol withdrawal applies some degree of objectivity to a somewhat subjective problem. However, it is possible to take it too far. A retrospective review of registry patients who received CIWA guided therapy was performed. A total of 124 records were reviewed for appropriateness of CIWA useand adverse events. They found that only about half of patients (48%) met both usage criteria (able to communicate verbally, recent alcohol use). And 31% did not meet either criterion! There were 55 nondrinkers in this study, and even though 64% of them could communicate that fact, they were placed on the protocol anyway! Eleven patients suffered adverse events (delirium tremens, seizures, death). Four of them did not meet criteria for use of the protocol. Bottom line: In order to be placed on the CIWA protocol, a patient must have a recent history of alcohol use, and must be able to communicate verbally. Some physicians assume that patients with autonomic hyperactivity or psychological distress are withdrawing and order the CIWA protocol. This can cover up other causes of delirium, or may make it worse by administering benzodiazepines. This represents inappropriate use of the protocol! Reference: Inappropriate use of symptom-triggered therapy for alcohol withdrawal in the general hospital. Mayo Clin Proc 83(3):274-279, 2008. What exactly is the CIWA protocol? 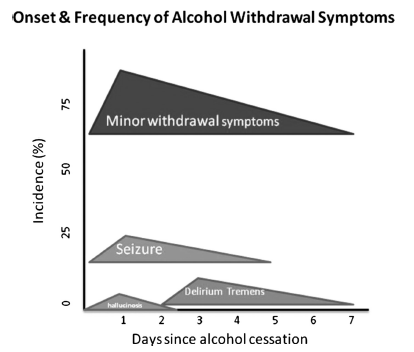 It is a tool used commonly in the US that helps clinicians assess and treat potential alcohol withdrawal. A significant amount of injury in this country is due to the overuse of alcohol. A subset of these patients are admitted and do not have access to alcohol. They may begin to withdraw within a few days, and this condition can lead to dangerous complications. All items are measured on a scale of 0-7 with the exception of orientation, which uses a scale of 0-4. All subscores are tallied to arrive at the final score. The total score is used to determine whether benzodiazepines should be given to ameliorate symptoms or avoid seizures. Typically, a threshold is selected (8 or 10) and no medications are needed as long as the patient is under it. Once it is exceeded, graduated doses of lorazepam or diazepam are given and vital signs and CIWA scores are repeated regularly. The protocol is discontinued once the patient has three determinations that are under the threshold. The individual dosing scale and monitoring routine varies by hospital. Look at your hospital policy manual to get specifics for your institution. For a copy of the CIWA scoring criteria, click here. Tomorrow, precautions when using the CIWA protocol. Giving Alcohol To Prevent Alcohol Withdrawal?? Alcohol abuse is a major problem worldwide, and provides trauma professionals with a never-ending stream of patients to take care of. A few of our patients partake so frequently that they are at risk for complications when they are forced to stop (e.g. admitted to the hospital). In days gone by, one of the possible treatments for alcohol withdrawal was actual administration of ethanol in the hospital, by mouth or sometimes IV (!). For the most part, this has fallen by the wayside. However, I do get questions from readers about it from time to time, and I assume that this still happens at some hospitals. And I know of a few hospitals that still have beer on the formulary! Bottom line: Don’t reach for the bottle when trying to prevent or treat alcohol withdrawal syndrome. Monitor at-risk patients closely, adopt a finely-tuned CIWA protocol (see below), and aggressively refer to treatment after your patient recovers. Reference: Ethanol for alcohol withdrawal: end of an era. J Trauma 74(3):925-931, 2013.